If you live in Santa Monica, and want to spruce up your backyard, why not install a water feature? A Santa Monica water feature is an easy way to bring some tranquility into your outdoor space, and enhance your relaxation when you spend time outside alone or with friends and family. A water feature will not only please your senses with the sound of water, but will also attract birds and block some outside noise. Busch Design Build, Inc. will help you make your Santa Monica backyard more green with these water feature design ideas. 1. 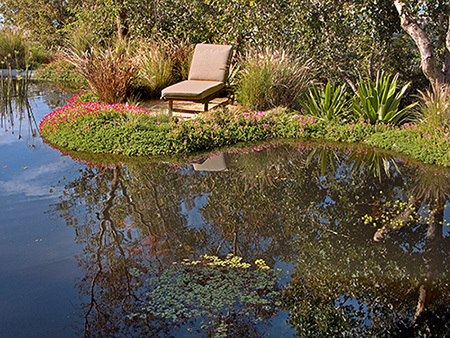 Pond – If your space permits, your local Santa Monica contractor can consult you about constructing a pond in your backyard. Keep in mind that a pond doesn’t have to be big, you can make a small pond that will be just as pleasing to the eye as a large one. This Old House Magazine explains how to build a Santa Monica backyard pond that is 40 feet with $300 and in just six hours. There are many choices when it comes to building a pond, from size, shape, rocks, plants, waterfalls, etc. See what they recommend here or call your local Santa Monica contractor for a consultation. Don’t have any space for a pond? Why not create a pond in a pot? HGTV explains that filling a pot with water and placing some water plants still in their pots in it still create a pond-like environment. Placing a few of these pot ponds around your outdoor space will enhance it’s appearance. 2. Stream – Can you imagine having brunch in your backyard next to your very own stream? If you would like to build this Santa Monica water feature, remember to first make sure to check out the area. You want to have a slope in your backyard where the water will flow, and you want the lowest point, where the water comes down, to be viewable by your and your guests for the maximum effect. eHow provides a simple step-by-step plan for building a stream yourself. 3. Waterfall – There are few things more relaxing that the sound of a brook or some kind of running water. That is why installing a waterfall as your Santa Monica water feature is a great idea. There are many options to installing waterfall; you can have one in your pool, or one in your pond. However, if you have neither, Garden Supermart explains how to build a pondless waterfall. If you don’t have the time to build your own waterfall, have your Santa Monica construction company mock up some backyard waterfall designs. And remember, if you don’t have the time or money to build a waterfall, you can always purchase a waterfall kit from your local hardware store. This will include a rock-like structure, a pump to circulate the water, and all the necessary items to get your waterfall up and running.